There are two ways to look at Voyager 1′s latest milestone and both remind us that distance on a cosmological scale is almost gloriously difficult to comprehend. The first is to celebrate the first terrestrial artefact from this small blue planet to depart our immediate neighbourhood and pass into the void of interstellar space. 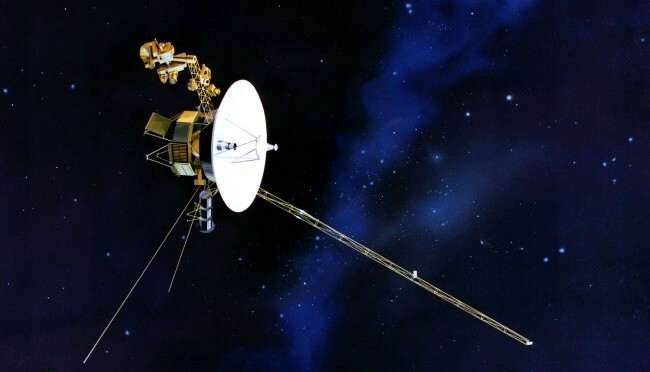 Voyager 1 – and its twin Voyager 2 – are currently our sole ambassadors to reach deep into the heavens. Beyond them there is no trace of us save some scant electromagnetic whispers. And it took no less than 35 years for Voyager 1 to reach the heliopause, moving at a prodigious speed that sees it travel an equivalent distance from the Earth to the Sun (1 astronomical unit, or AU) every 100 days. It is now so far from home that the Earth would be invisible to the naked eye, and the Sun would appear as little more than a bright speck on a background of countless other stars. On the other hand, 17.9 billion kilometres, or about 120 AU, is only the merest fraction of a drop in the ocean in the cosmic pond. To put it in perspective, the very outer limits of our solar system – defined as the vague edge of the Oort cloud of cometary ice and debris that falls under the gravitational influence of our Sun – extends some 50,000 AU. And then there’s our nearest neighbouring system, Proxima Centauri – which in cosmic terms is standing right on our doorstep – at 268,000 AU distant. Sadly, our first interstellar explorers won’t be awake to see, or report on, any close encounters with distant stars; their power supplies are expected to expire around 2020, sending them into an eternal sleep. At that point Voyager 1 will be 19.9 billion kilometres from the Sun and Voyager 2 will be 16.9 billion kilometres away, according to NASA. It is, however, expected that in around 40 millennia Voyager 1 will pass within cosmic cooee (as we say down here), a mere 101,000 AU, of AC+79 3888, a star in the constellation of Camelopardalis. In around 296,000 years, Voyager 2 will pass 272,000 AU from Sirius, the brightest star in the sky. While they’ll sleep through those and other future ‘close’ encounters, it’s a tantalising notion to think that perhaps they may, in turn, be observed. Space is vast, and even if there’s a little farther to go before Voyager 1 enters interstellar space, we are in the throes of making the first journey out of our back yard and into the wider world. It’s one small step, as they say.